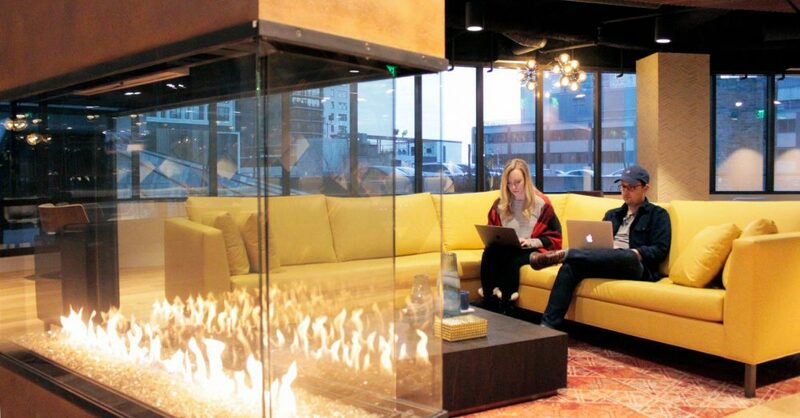 Two custom gas peninsula fireplaces were the perfect touch for the newly revamped third floor lounge of Fifth Street Towers in Minneapolis. Acucraft worked with Shea Design, IMEG (formerly LKPB Engineers, Inc.) and MP Johnson to bring two gorgeous peninsula fireplaces to the Fifth Street Towers renovation. Jordan, Project Coordinator at Shea Design came to Acucraft in late December 2016: “I’m looking to do a custom commercial indoor fireplace, two actually. I’m not quite sure where to start except that it should have glass on all sides and will need a flue.” Fireplace Advisor, Jill worked with Jordan to get all of the project details, and find the perfect fireplace for their space. Originally, the designers & architects had been inspired by a four-sided glass fireplace Acucraft had designed & manufactured for a multi-million dollar home in Tiburon, CA. After running through the logistical details and flue run, the team decided that two 3-sided peninsula fireplaces would be a better fit for their space. After deciding upon their fireplace design, and placing their order, the Shea Design team was then handed over to skilled Fireplace Designer, Robin to walk through the exact needs for the fireplaces. Robin worked hand-in-hand with the project architect, Erica, as well as the Principal Mechanical Engineer at LKPB Engineers, Inc, Michael to ensure the fireplace design met their expectations while also maintaining our safety standards as well as the city standards. Once all of the specifications and details were finalized, Robin provided the team with a full submittal for approval, including: a custom fireplace manual, drawings, and fireplace components & specifications. Upon submittal approval from MP Johnson, the two fireplaces then went into production and testing before making their way to the Fifth Street Towers to be installed. The MP Johnson team chose to have an on-site with one of Acucraft’s Fireplace Designers to help guide the installation process and ensure all components were calibrated and working properly. The tenants at Fifth Street Towers can agree that the renovation has been a complete success and everyone has been enjoying cozying up to the peninsula fireplaces in the 3rd floor lounge both for work & pleasure! Martin Williams Advertising in particular are enjoying all of the amenities Fifth Street Towers has to offer! It was a pleasure working with Shea Design, MP Johnson & IMEG on this exciting renovation. We look forward to future projects & partnerships! Get started on your own fireplace project today by requesting a free quote!